You can literally twist and bend these high tech light strips in all directions without worrying about damaging the product. 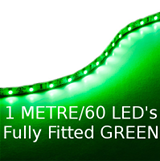 LED Strip Lights can even be cut to length so you can complete a professional install. These Durable, Flexible 12V LED Strip Lights can be installed quickly and easily in your PC Desktop. All LED strip lights come standard with 3M adhesive backing which means they can be stuck pretty much anywhere giving you endless creative possibilities. These will be constantly on when the system is turned on. They will turn off when Windows is shut down. If you would like a physical on/off switch then this can be done at an extra charge.